The forces that driver Andy Green’s body will be exposed to in BLOODHOUND SSC are not unlike those he has been trained to deal with as a fighter pilot. He will be shaken, compressed, disorientated, deafened and heated, but these are all in a day’s work for a pilot. The most important thing is G force, which will be produced when the Car speeds up and slows down. RAF pilots experience the same thing in their aircraft when turning quickly. This force pushes them downwards into their seats as their bodies literally become heavier. We measure G force in multiples of Earth’s gravity, as this is something we are all familiar with. So, when we are standing upright we are exposed to 1G. For the technically minded, what is responsible is actually an acceleration caused by the mass of the planet, which draws us towards it at 9.81m.s-2. When pilots ‘pull G’, they feel a force greater than gravity (for example, 3G is three times Earth’s gravity). This makes them feel heavy, and movement becomes difficult. However, this is not the only problem…. Because the blood in the arteries and veins gets heavier, pulling high G in an aircraft reduces blood pressure above the heart (and blood pressure in the legs is increased). At a certain G level, this effect is so strong that not enough blood gets to the head. This causes dimming of vision (greyout) as the eye is starved of oxygen and, at higher G levels, loss of consciousness due to lack of oxygen in the brain. 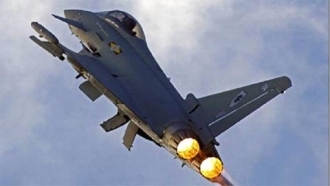 For cutting-edge fighter aircraft such as the Typhoon, this requires an advanced anti-G system to keep pilots conscious at up to 9G. The system includes full-coverage anti-G trousers which compress the legs to increase blood pressure and aid return of blood to the heart. It also includes positive pressure breathing which provides pressurised breathing gas when the G level is increased to raise blood pressure. The Typhoon is capable of sustaining turns of up to 9G, requiring the pilots to use a full-coverage anti-G suit and positive pressure breathing for G protection. Due to Andy’s very reclined seating position in BLOODHOUND SSC, the G force he will experience when the Car accelerates will be in a different direction to that he would usually feel when turning in an aircraft. As the Car accelerates, a force of around 2.5G will push him hard back into his seat. The force in this direction will also increase the blood pressure in his head, which may be a little uncomfortable, but will not carry any risk of losing consciousness. When he slows down he will briefly experience up to 3G in the opposite direction. This will throw him forward firmly into his harness, and blood will drain to his legs, which will reduce the blood pressure in his head. Although 3G is not usually enough to cause greyout when flying in an aircraft, the situation in the Car is slightly unusual because of the rapid G reversal that happens between acceleration and deceleration. While the Car is accelerating, the high blood pressure in Andy’s head will fool his body into making physiological changes to his heart and blood vessels to prevent any further rise in blood pressure. Stretch receptors in the blood vessels of his neck will detect the increase in pressure, and activate the baroreceptor reflex. This reflex triggers dilatation of small arteries (called arterioles) mainly in the muscles, causing a reduction in resistance of the circulation, which reduces blood pressure. At the same time, the rate and force of Andy’s heartbeat will be reduced, also reducing his blood pressure. During deceleration, these changes, coupled with the effect of the blood draining to his legs, could be enough to cause greyout. At this point an anti-G suit would be of use, but Andy should be able to counter any greyout just by using the anti-G straining manoeuvre, a special technique he has learned as an RAF pilot which helps to maintain blood pressure. The G force applied during acceleration and deceleration also has a strong effect on the balance organs (called the ‘somatogravic illusion’). When the Car accelerates, Andy will experience a strong sensation (principally through the otolith organs in the inner ear) that he is tilting backwards, as if the nose of the Car is rapidly pitching up. When the Car slows down, he will get the opposite sensation as if the Car is pitching down. To retain control of the Car, Andy must realise that these effects are just an illusion. During his RAF training, Andy will have experienced these effects in a spatial disorientation training simulator, as this illusion is also encountered in fighter aircraft. However, while it is a common effect, it is also a very powerful one and Andy will have to work hard to counter it. The vibration from the engine and the ground are likely to make it difficult for Andy to see the instruments at high speed, and this will be an important factor in the design of the Car’s cockpit. This is because his eyes will not be able to focus and track the displays if they are moving around very rapidly. In addition to vibration, Andy will need good hearing protection, not just to stop him being deafened by the extreme engine, airflow and ground noises, but also so that he can communicate with the rest of the team. Most of the physiological effects Andy will experience in the Car are similar to things he will have experienced as an RAF fighter pilot. While these effects are likely to be quite uncomfortable, physically tiring and potentially distracting, his training should make it second nature for him to deal with them, allowing Andy to focus on driving BLOODHOUND SSC and breaking the records!